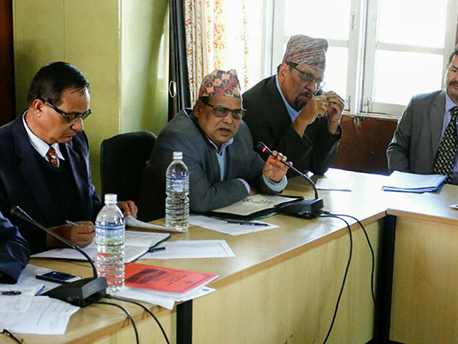 KATHMANDU, March 16: Nepal Rastra Bank (NRB) Governor Chiranjibi Nepal has cautioned microfinance institutions (MFIs) about growing anomalies in the sector and against deviating from their service motive of providing financial and banking services in the rural areas at a very low cost. Addressing the inaugural ceremony of the three-day ‘National Microfinance Summit Nepal 2017’ that kicked off in Kathmandu on Wednesday, Governor Nepal also said that the central bank would take needful action if MFIs are found breaching regulatory norms. He also said that lately he has been accused of allowing ‘new feudals to enter rural areas to exploit poor people by charging exorbitant interest rates on micro credits’. Amid growing complaints that MFIs were making huge profits and distributing large dividends by charging borrowers very high rates, NRB recently capped the interest spread for MFIs at 7 percent. Also speaking at the program, Minister for Finance Krishna Bahadur Mahara, however, lauded the role of MFIs in the development of rural economy. He also said that the government was committed to ensure that there is no shortage of funds for MFIs to make investment in rural economy. At a time when MFIs have been lamenting that the new requirement for commercial banks to make at least 2 percent of their loans directly in the deprived sector could dry up their funding, Nepal Bankers’ Association’s President Anil Keshary Shah said that the new policy would not impact microfinance institutions much. “Since the paid-up capital of commercial banks is being increased four times to Rs 8 billion, the three percent deprived sector financing through microfinance institutions would also increase,” he added. The summit, which is being held with the theme ‘Balancing Financial, Social and Human Values’, has brought nearly 800 participants from various stakeholders like the government, microfinance institutions, development partners, NRB and beneficiaries. According to organizers, 28 working papers related to microfinance issues will be presented by various experts and leaders of the industry. The summit, fourth in the series, is scheduled to discuss challenges and problems in microfinance sector and aims to bring stakeholders, including beneficiaries, under one roof to find solutions to them.